Cats have garnered a reputation as some of the laziest of at-home companions, appearing perfectly content with a lackadaisical lifestyle ripe with idleness and ease. But within even the most lethargic, vegetative-seeming felines lies a furry little action star just waiting for the right moment to prove their mettle. 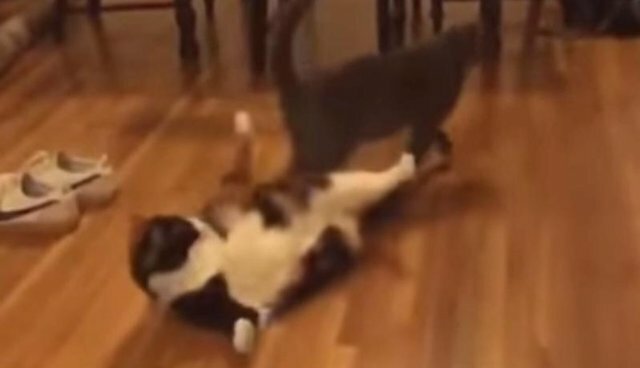 Here to prove that point is Juni, a by-all-accounts common sort of cat who'd fit right in for a fight scene in "The Matrix." When faced with a surprise attack from a rival kitty, she pulls off a rather impressive, gravity-defying stunt to avoid being pounced upon.